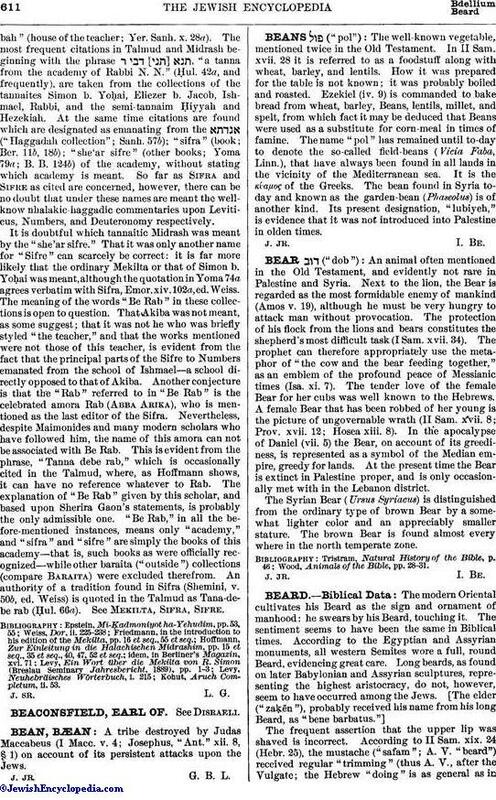 ("dob"): An animal often mentioned in the Old Testament, and evidently not rare in Palestine and Syria. Next to the lion, the Bear is regarded as the most formidable enemy of mankind (Amos v. 19), although he must be very hungry to attack man without provocation. The protection of his flock from the lions and bears constitutes the shepherd's most difficult task (I Sam. xvii. 34). The prophet can therefore appropriately use the metaphor of "the cow and the bear feeding together," as an emblem of the profound peace of Messianic times (Isa. xi. 7). The tender love of the female Bear for her cubs was well known to the Hebrews. A female Bear that has been robbed of her young is the picture of ungovernable wrath (II Sam. xvii. 8; Prov. xvii. 12; Hosea xiii. 8). In the apocalypse of Daniel (vii. 5) the Bear, on account of its greediness, is represented as a symbol of the Median empire, greedy for lands. At the present time the Bear is extinct in Palestine proper, and is only occasionally met with in the Lebanon district. The Syrian Bear (Ursus Syriacus) is distinguished from the ordinary type of brown Bear by a somewhat lighter color and an appreciably smaller stature. The brown Bear is found almost every where in the north temperate zone. Wood, Animals of the Bible, pp. 28-31.